I keep waiting for Paul McCartney to release another masterpiece. Like the connoisseur of both new and vintage refreshments shipped from distant lands, I continue to buy new releases by Mr. Paul McCartney, sight unseen, hoping that he’ll deliver yet another musical treasure that contains some of the magic that once spewed forth like a mighty river. Everything he ever did with the Beatles was brilliant, and during certain periods of his solo career, he actually created some excellent work comparable to his masterful work with the Fab Four. Is it so much to ask that lightning continue to strike over and over again? Can a musical genius consistently reach the plateaus of brilliance each and every time he releases yet another album in the 50 or so years of his musical career on this planet Earth? I wish that were the case for Mr. Paul McCartney. I cannot help but love the man that was one of the primary architects of the musical group that changed my life like no other cultural, political or artistic influence. The Beatles are forever a part of my DNA, and any chance I have an opportunity to witness a concert with survivors McCartney or Starr, is comparable to visiting the holiest of places a human being can ever visit. If you haven’t guessed by now, yes, I am indeed a big fan of the Beatles. That being said, the latest release by Paul McCartney is a mixed bag that I may grow to love like the other classics he created in the past. Right now, it’s the new album with some great tracks and a few that I’m still not sure about. 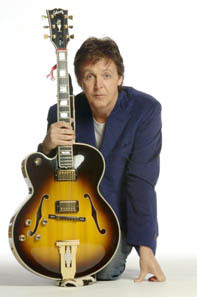 Like the previous album, Paul plays most of the instruments, and does all the vocals. It’s a rather ambitious album, and it’s got a lot of interesting sounds on it, as McCartney demonstrates some of the tools that made the Beatles such a versatile group. The opening track “Dance Tonight” is an infectious little track that makes good use of a mandolin. Or was it a ukulele? I don’t know, but it’s got a great sound for the opening track. “See Your Sunshine” reminds me of a lost Beach Boys track with rich textured sounds enhanced by harmony vocals by Paul, Paul and Paul. In fact, the whole album is very textured, with a variety of orchestral sounds. “Vintage Clothes” is a charming little ditty that reminds me of a lot of musical styles. “The End of the End” is a poignant ballad that discusses one’s mortality, a subject Paul knows all too well with the loss of his companions John, George, and the lovely Linda. I actually bought the deluxe edition, which is an awkward package in a DVD-style case that’s totally unsuitable for those that do much of their CD listening in their car. Despite such drawbacks, I’m very glad I was able to hear the three bonus tracks on this edition, but I can’t help but think that this album would have been much stronger if these tracks were included in the regular package. Two of these tracks are sharp little instrumentals that provided a nice contrast to the other pop songs. As much as I love the music of Paul McCartney, I sometimes think he underestimates some of his best material. Some of his greatest recordings in the past twenty years have only been released as b-sides or bonus tracks on limited edition EPs. The demos he recorded with Elvis Costello are some of the best unreleased recordings I’ve ever stumbled across. Instead, many of his more recent albums are often plagued with sub-standard pop songs that are all too forgettable. Overall, I’ll have to say that I think “Memory Almost Full” is a step in the right direction. It may not be on the same level as “Band On the Run,” “Ram,” or “Red Rose Speedway,” but it’s certainly one of the most powerful albums Paul McCartney has released in the past 10 years. Thank you, Paul. May you continue to explore the frontiers of music for a long time to come…. 1 comment to Another McCartney review? McCartney has made so much music that there’s bound to be the odd clunker.For me its Biker like an icon-which is not worthy of him. But its true that not even McCartney realises what gems some of his lesser known songs are or could be because he’s too close to it. Thus Temporary Secretary is better in covers by other people-by him its a melody struggling to get out and he ought to rework it as a BALLAD. Way to go-a song on his last CD-is very close to Things we said today. But the best of the “lost gems” is My Carnival-the Carribean beat and New Orleans sound makes this a better song than Helen Wheels or Juniors Farm.